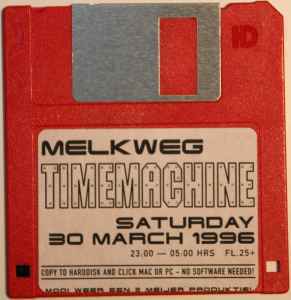 Rave flyer for Timemachine in the Melkweg venue in Amsterdam on march 30th 1996, on HDD 1.44 MB floppy. It's possible to walk through the Timegates by clicking. Timegate 1 features a looped techno track which plays when you click "Vision Control". There's the sound of a clock on the Timemachine infopage and the sound of mosquitoes in Timegate 5. I know someone who has this. It is pretty cool. I made an Ancient Aliens joke using this.